The internet is the best thing to happen to conspiracy theories since the moon landing. It has allowed once-fringe ideas about the true makeup of the world to congeal and gain steam and, eventually, elect a president of the United States. Perhaps the most beautiful of internet conspiracy theories is the flat-Earth movement, which is the impetus behind many wonderful Instagram accounts and also several extremely questionable assertions by NBA stars. What makes the flat-Earth theory different than, say, JFK truthers is its thundering clarity: The scaffolding of the theory is byzantine and involves an invisible anti-moon, but the core of it is that the horizon looks flat so it must be. There’s something charmingly tautological about it. A new Atlantic article by Sam Kriss dives into the latest wrinkle on the flat-Earth theory, and it is majestically insane while also being characteristically objective in its reasoning. Posted last fall, “There Are No Forests On Flat Earth Wake Up” has been viewed a half-million times and netted some 10,000 response videos. It’s a thrilling 80-minute dive into a deep hole of conspiracy theorizing, and worth every second of your afternoon, if you can spare it. Still, if you’re not of the disposition to do so, the Atlantic article neatly synopsizes it. We start with a montage of forests, peaceful scenes studded with sunlight, the kind of pictures just waiting for some inspirational quote to be plastered on top of them. We’ve all seen forests, we all know what they are; how could anyone claim that they don’t exist? But our narrator knows better. “They make us think that this is a forest,” he tells us, “when you are actually looking at thirty-meter bushes. After watching this video, you will reverse your concept of forests by 360 degrees.” This isn’t a forest at all: only a diminished imitation. Thousands of years ago, a cataclysmic event destroyed 99% of the Earth’s biosphere, and when it happened, it took away the real forests. Real trees are nothing like their stunted cousins, the miserable perishing scraps of wood that we see today; they were truly vast, hundreds of kilometers tall, magical organisms that sustained a total living ecology of the flat earth. 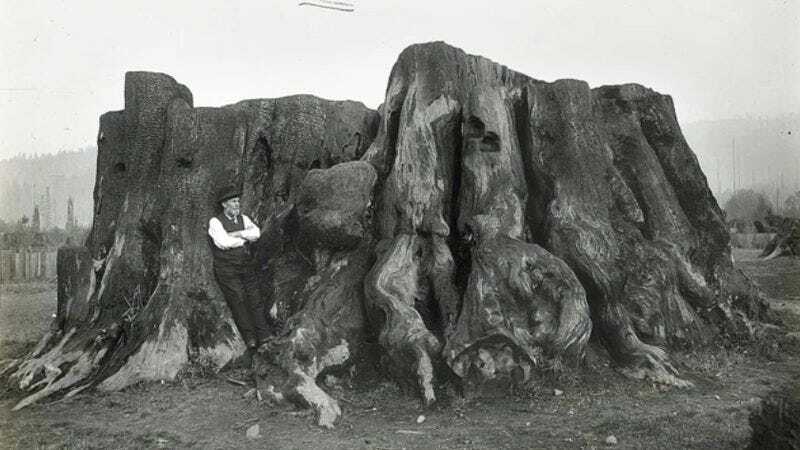 Yes, this giant Pandora-like world of continental tree ecologies was felled by massive machines, and the evidence of this mythic past is hiding in plain sight—that is, our many mesas, cliffs, and mountains that look somewhat similar to tree stumps. Thus, following normal flat-Earth thinking, they must actually be trees, a leap of logic which then ladders into numerous other questionable claims, like the fact that there was a nuclear war in the 19th century. Kriss finds more than point-and-laugh importance here, though, contextualizing the theory within greater patterns of ecological thought and, indeed, human behavior. Against both the panpsychicism of hippie ecology, the bleary-eyed invocations of some dismally all-encompassing Mother Earth, and the pedantic materialism of most sciences as they’re actually practiced, ‘No Forests on Flat Earth’ proposes a kind of hylothanatism, a pessimism for our own weary age: this world was once alive, everything was once beautifully connected, but not any more. This earth has been dead for millennia; what we think of as progress is just the rot spreading through the cadaver of the world. The entire article is well worth spending some time with, as is the original, completely batshit video itself.